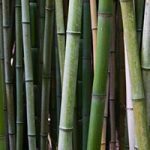 Bamboos like a moist (not waterlogged) soil and sun or shade. If bamboos are harvested for shoots and/or canes they should never become a problem in terms of spread. Bamboo shoots are a fantastic spring perennial vegetable!